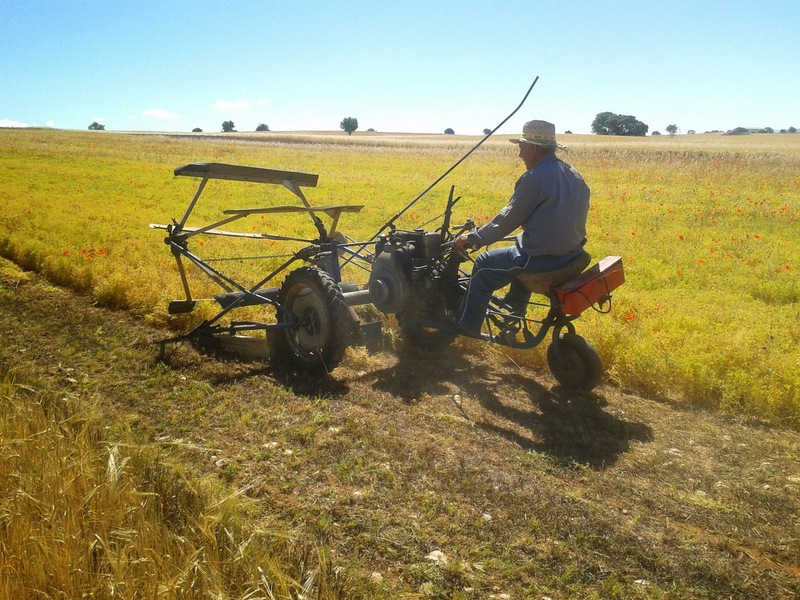 Peter Rubio and his Peter son worked with their old BCS mowing again (its cuttebar is of 1.5m and it has a diesel engine of 14HP with manual startup!!. It doesn't have a steering wheel so it is driven by pedals... the driver's hands are used to get up the cutterbar, clutch, brake, throttle, lock...) and we were lucky to see this machinery when they started to mow their lentils, three weeks ago... it was really funny and we could remember old times, when we were kids and our father used this type of machinery. These mowing machines were commonly used in the 80s and 90s and even in our village there were several races in our local holidays. 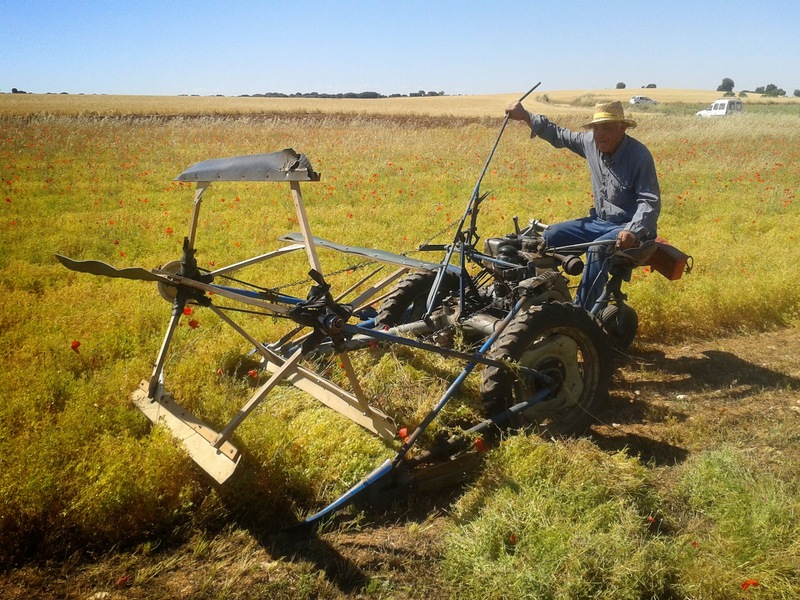 In the morning, when they began to mow, they had serious problems with the cuttebar because all blades were too much worn down and besides the lentils were wet. They had to stop repeatedly. 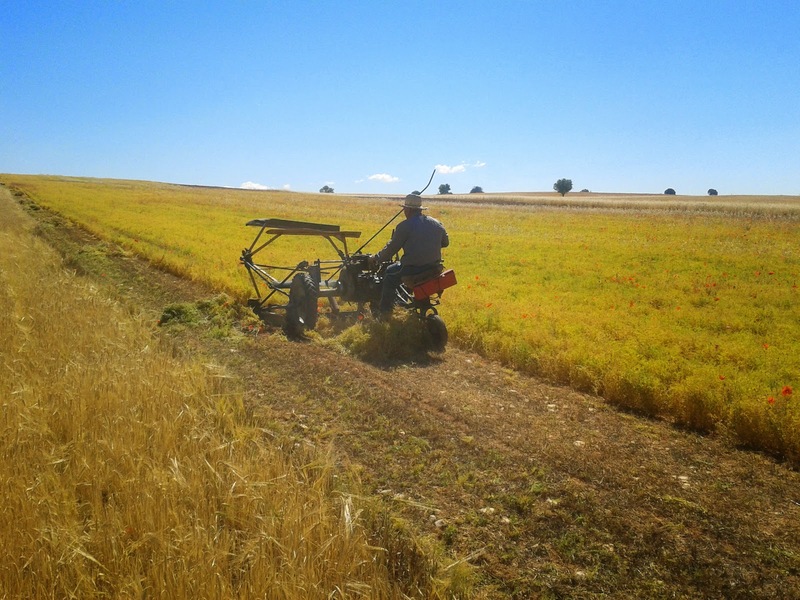 In the afternoon, the mowing machine worked very fine and they could finish the field of 2 ha without problems. This machine surprised us how it can do the stubble... it could cut lentils at ground level. Some farmers used old combines, but the stubble is worse. 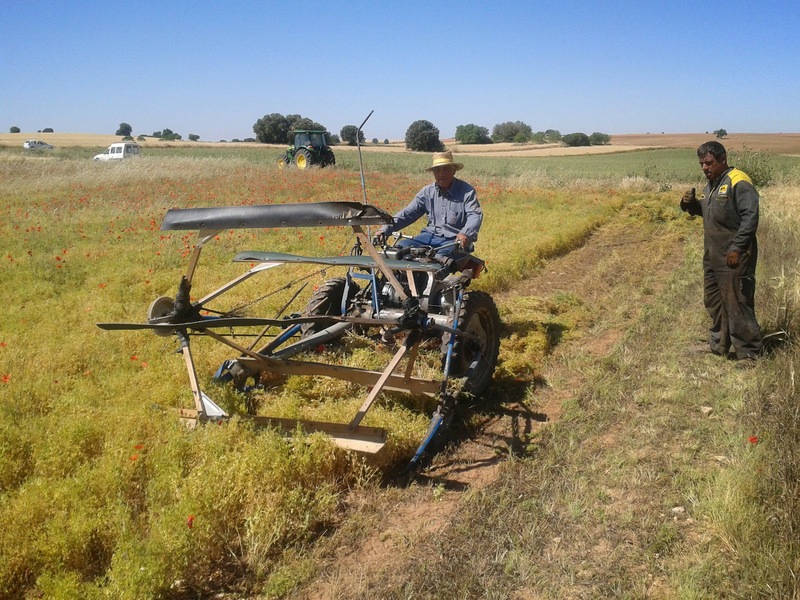 After mowing the lentils (Castellana lentils), they had to put them in rows for thresher machine can pick them up later. This task is manual, as you can see in our pictures and video, too. Our friend Peter used an old wood fork and the job was really confortable and quick. This post is absolutely FANTASCTIC!! The young man is really funny and if you can understand Spanish language, you cannot miss the video. The photos are really good but the video is gorgeus. Este post es fantástico, en mi opinión de los mejores. Las fotos son buenas pero lo mejor es el video.Pedro hijo es único, no os podéis perder el video. Thanks a lot for your comment!! The video is really funny. Muchas gracias por tu comentario. ¡El vídeo es realmente divertido! Así es, ha cambiado mucho y la maquinaria ha evolucionado muchísimo. Por cierto, aunque ellos utilizan la segadora BCS, el cultivo de la lenteja también a evolucionado ya que ahora no hace falta llevarla a la era para trillarla, sino que hay máquinas que la recogen y la trillan... incluso algunos agricultores lo hacen todo directamente con la cosechadora. Que maquinas mas curiosas, recuerdo muy lejano cuando en mi casa aun usaban una BCS, pero esta de cuatro ruedas. Hoy en dia ya es impensable, o cosechadora o segadoras autopropulsadas. Las de cuatro ruedas que indicas son algo más modernas que esta de tres, pero el funcionamiento es casi igual. La verdad es que es muy curioso ver lo bien que funcionan.